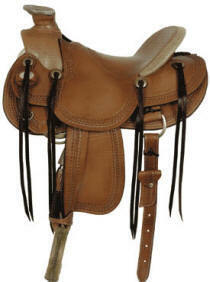 The Western saddle traces its genesis to Spanish and Mexican influences. These saddles initially came in to use on cattle ranches and grazing lands where the cowhorse worked cattle for the vaquero. As cattle ranching spread from Mexico north, three separate styles of Western saddles evolved. Geography and the type of cattle influenced this emergence of different styles of saddle. These working cowhorses and working cowboys needed tack that made their jobs safer and easier. In open areas such as parts of California, the cowboys worked the cattle by roping them. The wide-open spaces allowed the cowhorse to line the cowboy up with a running cow so he could throw a lariat to rope it. The cow was then dallied to the saddle by the lariat. The dally was loose so that the horse would not be jerked off its feet or its withers jarred by the saddle as the running calf hit the end of the rope. In the Texas brush country, however, the cowhorse was trained to move the calf out of the brush by cutting it out of the herd and brush so that the wrangler could get a good throw. Since the calf was not generally running, this cowboy roped and tied the calf tight to the horn. Besides stout horns for dallying the ropes with several hundred pounds of calf at the other end, the Western saddles were developed with the back cinch. This second cinch kept the saddle in place when the calf hit the end of the rope and when the cowhorse worked the calf by taking up the slack as the wrangler dismounted to rope the calf. While the Western saddle has a rich New World Spanish history, it is still evolving today. At one time, the Western saddle served the cowboy in making his living. It had to be stout, dependable and designed for the comfort of the horse and the safety of the rider. Today, the Western saddles are still ridden for cow working, but a whole new pleasure industry is demanding a different kind of Western saddle. Today we will find basically three types of Western saddles. The Western equitation saddle is designed for showing or parades. The saddle is built almost to force the rider into the correct equitation seat. It is heavily tooled, ornamented with silver and generally designed to look pretty. While it should meet the criteria for fit for both rider and horse, it is not a working saddle and was not designed to hold up to the rigors of ranch work. 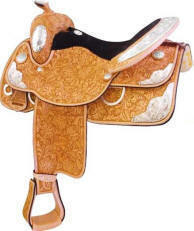 A dallied calf would simply rip the horn right of this type of saddle. The seat is heavily padded and built up in the front to throw the rider into position. 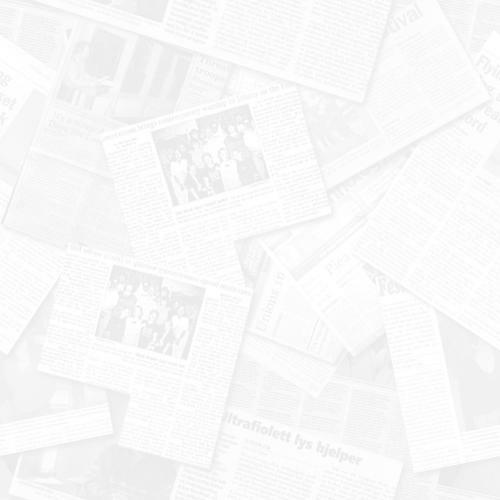 Swells are medium height. The Western Roping Saddle, on the other hand, is made to stand up to the rigors of ranch work. It is heavy duty and stout weighing considerably more than the equitation saddles. The horn is designed to hold a roped calf - at least 3 inches in diameter and 3 inches high. The swells and cantle of the roping saddle are low and designed not to interfere with the cowboy's dismount. The All Purpose Western Saddle is light weight, deep seated with high swells and cantle to keep the rider secure and comfortable. Most have a padded seat for long hours on the trail. The horn is much smaller and less sturdy since the most that is dallied around it is a canteen or horn bag. The foundation on which any saddle is built is the saddle tree. 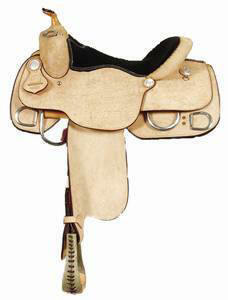 For the western saddle, traditionally the tree was made from beechwood covered in rawhide. Given the new materials available, modern trees may be made from anything from wood to pressed laminated wood to fiber glass. There are standard trees or you can have one custom made to fit your mule. If made of wood, the newer saddles have trees made of plied wood. Plied wood is layered with the grain placed facing in different directions and glued under high pressure. This process creates a tree that is warp resistant and superior in strength to solid wood. The tree is made up of the fork, the horn, the bars and the cantle. The gullet and the swells make up the fork. The gullet is that part which gives shape to the fork and extends across the withers. The height and width of the gullet is determined by the width of the mule and the intended use of the saddle. In most western standard made saddles the gullet may range from an average of 5 ¾ inches to 6 ¼ inches wide and 6 ¾ inches to 8 inches high. If measured from swell to swell, gullets average 10 2 to 14 inches. The swell is the shape the fork takes from the horn down - modified swell fork to undercut swell fork. The undercut swell fork resembles a pair of horns on either side of the saddle horn. This allows the rider to hook a thigh under the swell to maintain stability during a quick turn. This undercut style is not preferred by ropers who might catch a rope on it. Saddle horns come in a variety of sizes and materials. Wood, brass, steel or iron can be covered in smooth leather or rawhide. Horns are attached to the tree by either bolts or screws and come in types such as regular, egg-shaped pelican, two rope, high dally or double dally. Saddle use determines the size, shape and height of the horn to be put on a saddle. If it's a roping saddle, the horn will be stout, wide. If it's a pleasure saddle, the horn will be small in case the rider needs to grab it for security. The bars are the part of the tree that comes in contact with the mule's back. This is the part that must fit correctly for the optimum comfort of the mule and correct balance for the rider. The standard bars include the 5 2 inch Regular, the 6 inch Semi Quarter Horse, the 6 2 Quarter Horse, the 6 ¾ inch Arab/Morgan. Any other measurement must be custom made. The cantle rises in the back of the tree and is designed to keep the rider deep in the saddle. 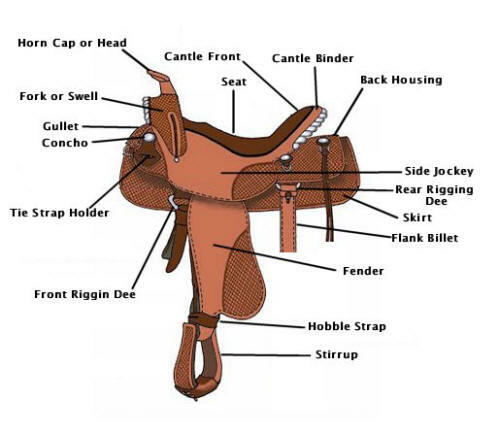 Cantles have different shapes depending on the work the saddle is designed for. The configuration of the tree's parts give the saddle the end silhouette and the best blueprint for success in the job for which it is intended. Seats range from flat to built up, from slick to suede, from small to large. Seat type is the deciding factor for the comfort of the rider. Each rider will have his or her preference for the work done in the saddle. The shape of the seat and the rise from the cantle to the fork is critical in keeping the rider in the correct position. Cutters and reiners prefer flat seats that allow the rider more movement forward and back. Pleasure and trail riders might prefer a seat that rises steeply from cantle to fork to hold the rider securely in the seat. This type of seat is also preferred by the equitation rider because it keeps the rider locked in the correct position. Seat measurement is determined by measuring the distance between the center of the fork across to the center of the cantle. The rider wants a seat big enough to allow freedom of movement. It is important that the rider remain free to move the stirrup leathers freely. Seat sizes range from 14 ¾ to 15 ¾ inches. When sizing the seat to the rider, remember to take into account amount of padding, quilting and rise. All these factors shorten the length of the seat of the saddle. Remember too short a seat is less comfortable than too long a seat. 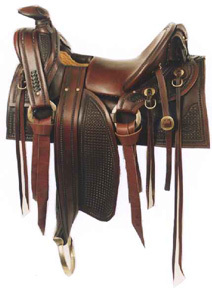 The rigging of a saddle indicates how it is balanced on the mule's back and how the girth is attached. As a result of the cattle work early cowboys had to do, they developed what is called the double rigging. Double rigging differed from the center fire rigging used in the English saddles, the old Mexican saddles and the vaquero saddles, in that it consisted of two rings - one at either end of the tree. This double rigging, also referred to as full rigging or rim rigging, provided greater stability to the saddle and rider as the cowboy roped, stopped and held a couple of hundred pounds of moving calf. Greater stability meant less trauma to the horse's back from the impact of the calf hitting the end of the rope and jerking the saddle forward. The double rigging is now the norm in most Western saddles. The other types of rigging may be found in specialty saddles and antique saddles. For today's pleasure riders who do not rope, the double rigging may seem cumbersome. It can prove to be uncomfortable for both rider and mule. The forward cinch has a tendency to rub the mule directly behind the elbow when the mule or horse is steep shouldered. They are showing interest in a seven-eighths rigging which positions the front D ring behind the normal position, but still forward of the center fire point. The in-skirt rigging has become popular with pleasure riders. This rigging has the rings sewn into the saddle skirting. This type of rigging has minimal bulk under the rider's legs, lies closer to the mule and allows the stirrup leathers to swing more freely. Of course, this type of rigging is not intended for holding a cow, but is very popular with trail riders, pleasure riders and those who show their mules. Some Western saddles come with a three way rigging which allows the rider to adjust the rigging as needed. This type of rigging has two slots in it which allows the rider to choose which slot through which to put the tie strap. This type of rigging allows for the many diversities of mules, riders and riding styles. The saddle purists would quibble with this type of rigging. However, it is helpful when a rider has a number of mules and does not want to purchase a saddle with specific rigging for each. There a two ways to fit the Western saddle to your mule. One is to have a custom made tree designed for your mule and the other is to carefully fit the ready made saddle to your mule. In both cases, the tree is responsible for the comfort of your mule. The tree's bars run along the spine of the mule and spread the weight of the rider evenly across the mule's back. The distance between the bars, their flare and their length affects this weight distribution over the bars. Regular Bars have a 5 2 inch wide gullet. They are shaped at a steep angle giving them a narrow spread. These tend to fit Thoroughbred type mules better. Semi Quarter Bars have about the same spread but the gullet is carved out to 6 inches to make the bars flatter. The Quarter Horse bars are 6 2 to 6 ¾ inches wide inside the gullet. This bar opens up a bit more to accommodate the muscular shoulders of the heavier stock mule. Arabian or Full Quarter Horse bars are 6 ¾ to 7 inches with flatter angles. This fits the flatter withered mule better. In addition, there are saddle makers who make specialty trees designed for the needs of certain breeds. Arabian saddles are built for shorter backed animals. Mules out of Arab and Morgan mares might benefit from this type of tree. In order for the fit to be good, the bars must lay smoothly along the mule's back. 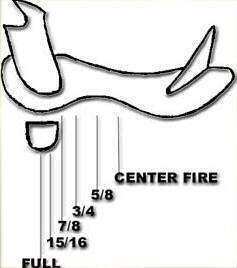 This effectively distributes the rider's weight evenly along the spine of the mule. Once you cinch up the saddle, stand two fingers between the mule's withers and the top of the gullet. If there is not room for your fingers, the gullet is too wide. If it is too wide, when the rider puts weight in the saddle and the mule moves, the saddle will hit the mule on the withers. the tree is too narrow. The bars extend slightly beyond the point where the cantle is attached to the tree. This provides support over the mule's loins and kidneys by distributing the rider's weight evenly over this tender area of the back. If the saddle rocks more than an inch from back to front, the bars are not making good contact and the tree may be too short or too long for the mule's back. Keep in mind that a saddle that fits your mule when he's two years old may not fit him at six. Saddle fit will be affected by maturation, weight loss, weight gain and fitness. Even your custom made saddle may no longer fit as your mule's back changes as he grows older or becomes more fit. Constantly, check the fit of your saddle. In addition, mules inherit conformation characteristics from both sire and dam. Their back conformation can be as varied as the breeds of donkeys and horses used to breed for mules. No two horses are alike. No two mules are alike. Fitting the saddle correctly to a mule's back is important, not only for the comfort of the mule, but also for the execution of the maneuver of the job the mule is asked to do. An ill fitting saddle can be tolerated by most mules. However, if you want the best for your mule's comfort and the best performance from your mule, you must have a correctly fitting saddle. After all, you can't do your best two step in a tight pair of boots!